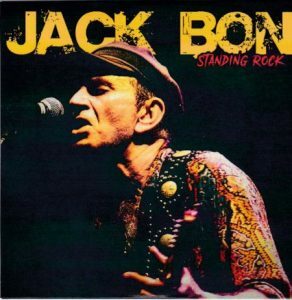 Jack Bon’s latest offering, Standing Rock, harks back to the rockin’ blues and boogie of a Rory Gallagher, with maybe a little essence of Bad Company and, I dunno, Mott the Hoople thrown in for good measure! Based in Lyon, France, Jack Bon has been a fixture on the European blues-rick music scene for well over three decades, and has honed his craft over the course of some 40 albums and countless live performances. Bon, the guitarist-singer of the legendary 70s French band Ganafoul, performs his catchy, original compositions and covers with a simple but very effective approach to both his singing and his playing. 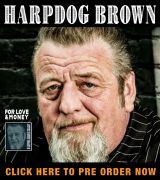 From the collection’s opening track, “Long Big Fight,” all the way through to the CD’s closing track, “Saturday Night”(a recast of a song he had written and performed much earlier in his career) the listener is treated to some simple, yet hard-driving power-trio blues that will have your feet tapping in no time. From the mid-70s to the early 80s, Ganafoul – also a power trio format – recorded 5 albums, and had generated considerable buzz both in their hometown of Lyon and across much of Europe, along with a loyal following. Bon’s current band – the Jack Bon Trio – was formed in 2012 and features Bon on guitar and vocals, with Chris Michel on bass and Rudy Rosselli on drums. It maintains the vitality of his earlier efforts, along with an assuredness that only comes from honing one’s craft over the course of several decades. The 12 tracks on this collection are mostly Bon’s compositions, and it’s an impressive collection of songs and straight-ahead performances. Two notable exceptions are a solid remake of Bob Dylan’s “Absolutely Sweet Marie,” and Slim Harpo’s “I’m a King Bee.” The Dylan cover, in particular, is truly memorable, and shows how a really great song can be interpreted in many different ways and still remain true to itself. Bon is often seen playing a single-pickup, Strat-style guitar into a Music Man combo, and with that simple combination, he gets a sound that is both direct and powerful, yet can be nuanced when the song calls for it. Bon’s original compositions feel both intimate and at the same time universal, and appear to be derived from personal experience. The disappointment expressed by “Another Friend Is Gone,” and the desperate feeling found in “It’s Your Turn” are universal, and become even more so as we age. “It Could Be You, It Could Be Me,” is Bon’s clear-eyed look at homelessness, and how the unpredictability of life’s many twists and turns can cut anyone down to size. Guest artist Jim Barbiani provides a stirring slide solo to this track. “The Day You Left Me” is a slow, minor key blues-rocker in which Bon paints a wonderfully evocative atmosphere with both his droning rhythm guitar and his searing solo. And, in spite of its underlying message that our lives pass by ever so quickly, “Gone So Fast” has an almost western swing feel to it. 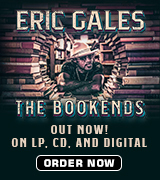 “Good Loving Mama” is Bon’s ode to his mother, and features Lino Muoio guesting on the mandolin. “Boogie Man, Rock n Roll singer” is a relentless rocker, a tribute to a musician’s life on the road. In addition to Muoio and Barbiani, other guest artists on this collection include Luc Blackstone on background vocals and G.G. Miller on tambourine. If you’re a fan of energetic, rocking blues and boogie – with catchy hooks, interesting lyrics, and soulful, yet understated singing and playing – do check out Jack Bon’s Standing Rock. There’s a lot to like here. I love it, and hopefully you will, too!